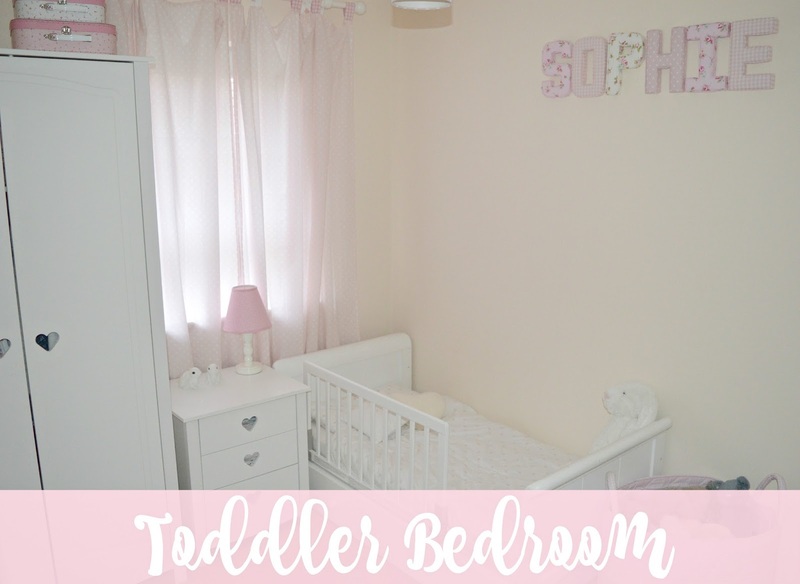 After moving into our new home earlier in this year, I couldn't wait to get started on Sophie's new bedroom! It's very similar to her old bedroom, although I have made a few changes. It's finally complete and I just couldn't wait to show you all! I love how bright this room is, compared to her old bedroom. I have tried to keep it quite minimal with the white furniture and pink accessories and I've kept the walls magnolia, as I got pretty fed up of the pink walls in the last house. We're also renting, so I didn't see the point in painting the walls again, to then have to put repaint again before we move out (which hopefully won't be for a while!). I wanted the room to grow with her and you will probably notice there are a lot of floral patterns, gingham and polkadots but I think these patterns are suitable for a child as well. This is the same cotbed which we had in our old house, which was bought a few years ago now. 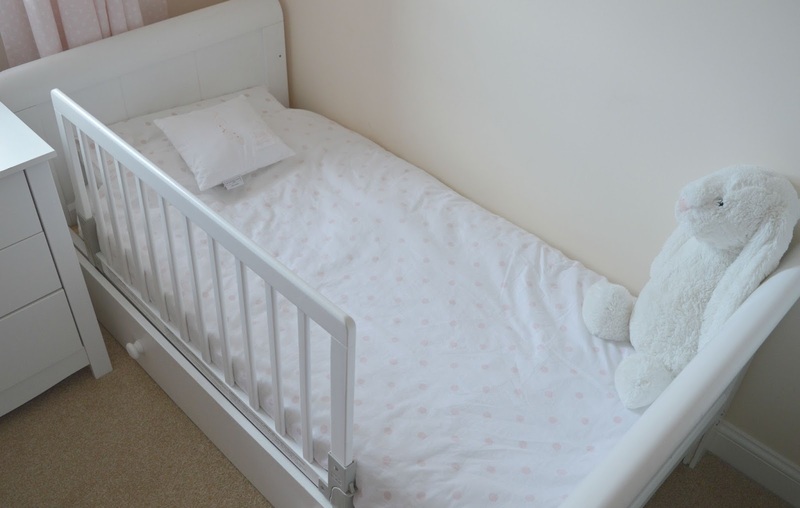 The wooden bed rail was great for when we made the transition from cot to toddler bed and it matches her bed perfectly. 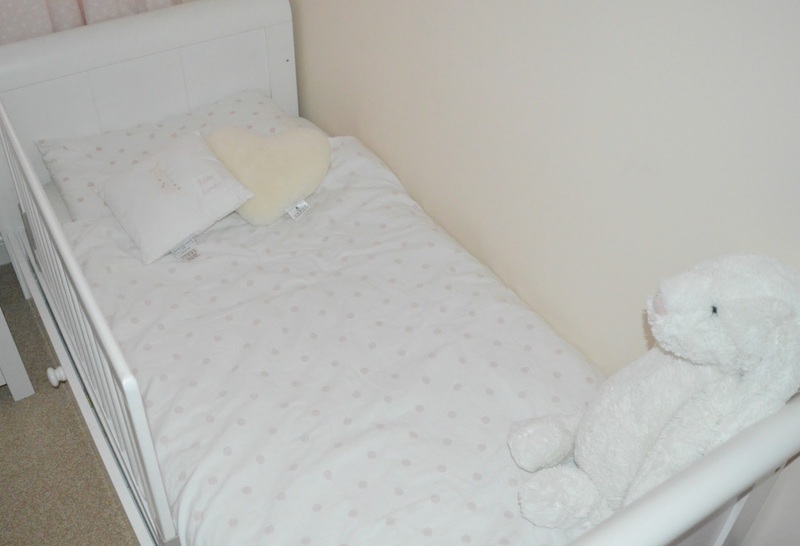 If you're considering transitioning from a cot to toddler bed, I have written a separate post about it here. The cushions, bunny and bed linen are all from The Little White Company. I bought the 'little dancer' cushion a while ago now, so unfortunately it's no longer available but you can buy a similar one here. 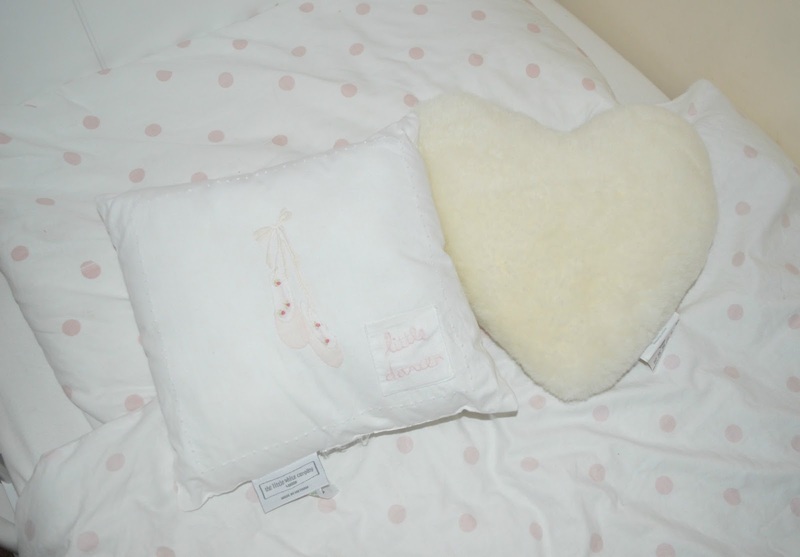 The cot bedding is still available as well as the sheepskin heart, which you can purchase here. 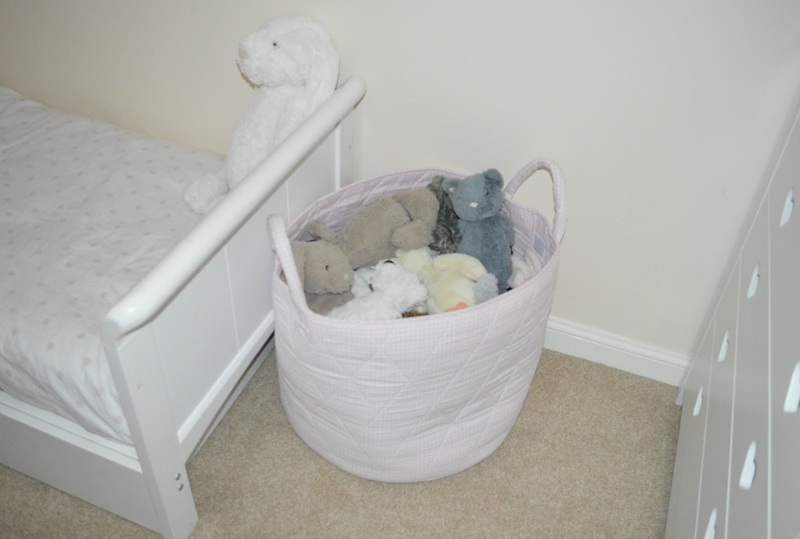 I love this pretty storage tub which currently holds all of her soft toys (which is rather a lot!) You can find a similar one here. I absolutely love these name letters which I ordered from The Lovely Letter Company. They're so beautifully made and the fabrics I chose match the room perfectly. We also have the matching bunting on the opposite wall. You can now order letters through their Etsy shop. You've probably already seen these before, but they're the Ikea picture ledges. I love switching Sophie's books around to suit the current season. 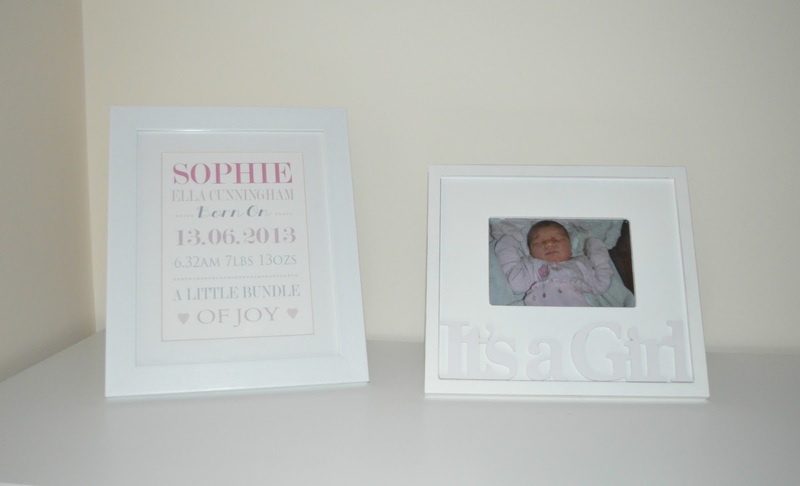 The one on the left is Sophie's birth print which we received when Sophie was born and the one on the right I bought from a random shop when I was pregnant. The pink gingham lamp and floral suitcases are both from Laura Ashley and the little bunny lights are from Next. The jewellery box was also from Next, which currently stores her hair accessories. 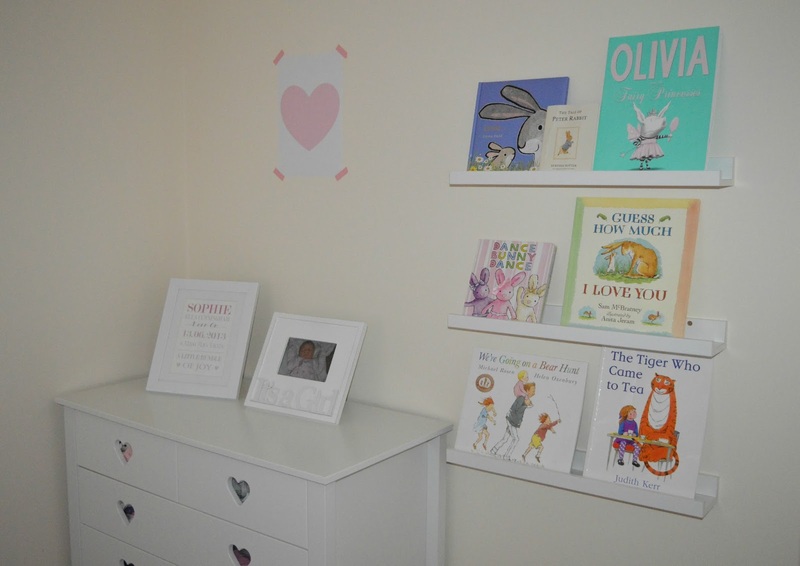 What do you think of Sophie's new bedroom? * This post was originally published in September 2015, but I have since updated it. Lovely bedroom! The letters are my favourite I think they are fab. 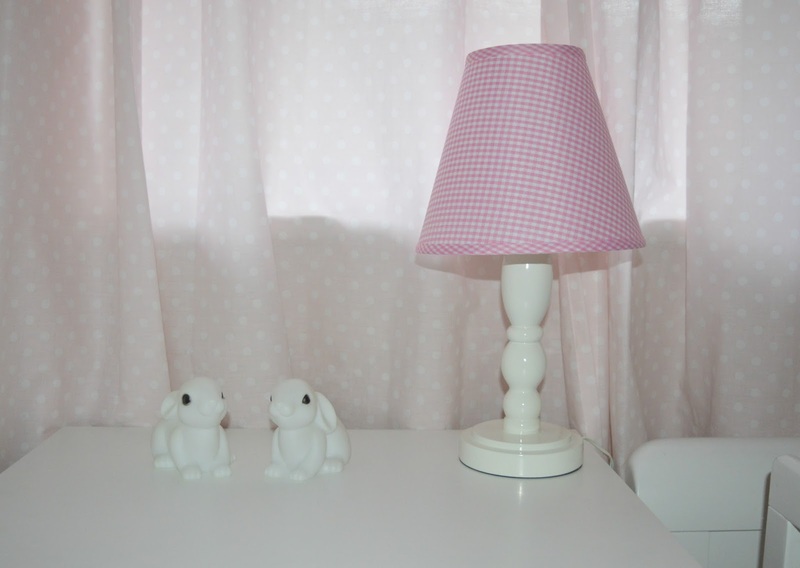 I love little girls rooms that are nice and bright with cute accessories and pops of colour! This is a beautiful bedroom. I'm trying to do something like this for the new babies nursery at the moment. 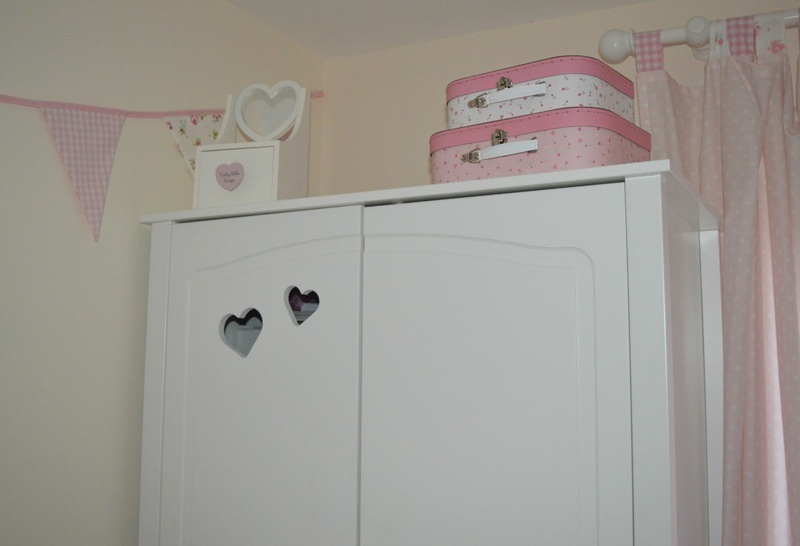 White furniture and then floral fabrics to bring some colour into the room so it can grow as the baby grows. I really love this. Such a gorgeous, really subtle pink bedroom. I can't wait to own my own home and decorating. What a lovely bedroom. Love the white and pink. Very clean looking and very girlie. What a fabulous looking room! I wish i had the styling skills to do something like this! SImple is good! I love the book shelves too and the books. Some of my favourites on their! Wow a beautiful room for a little girl. Love the crisp white with hints of pink.